At the start of play, blasting aliens will be easy. The insect-like ships will arrive and leave in a fixed pattern and you just have to move your ship in line to destroy them quickly. But as you move to other sectors, alien movement patterns will be complex and confusing. In such situations, take a break. Lift your finger immediately to pause the game. Behind the “PAUSE” text you can still see aliens moving or bullets grazing past your ship – all in slo-mo. This breather will help you avoid getting destroyed by enemy bullets. Hint: If a bullet is coming towards your ship and if you lift up your finger at the right moment, just before it hits you, the bullet will go through your ship without destroying it. Try it. Alien waves can come from anywhere – top, left or right. The left/right side of the screen glows just before an alien wave arrives from either side of the screen. The glow on the left or right side of the screen kind of warns you of incoming enemy wave, so be ready when you spot one and try to move to your left/right depending on the glow to hit them before they start appearing on the screen from the left and right side or the screen. Destroyed aliens will drop abilities and coins from time to time and you can drag your ship up, left right or in any direction to grab them. Greed may overcome fear if you spot two abilities or plenty of coins floating in the sky and you will move forward to catch them, ignoring a massive swarm of aliens and their bullets. Taking such risks will destroy your ship as your focus will quickly shift from enemies and their bullets to floating coins/abilities. Don’t be greedy. Let abilities come down and then move your ship up once you feel it is safe to collect them. Yes coins won’t stay for long and will flicker and disappear if not collected on time, but it’s better to leave a few coins than head towards death. In Boss rounds, your focus should be on waves of bullets and alien swarms. The huge insect-like alien boss will try its best to make you feel totally lost and confused with its minions and bullet waves. Since your ship will fire automatically, you just have to focus on enemies, dodge bullets and incoming enemy waves. 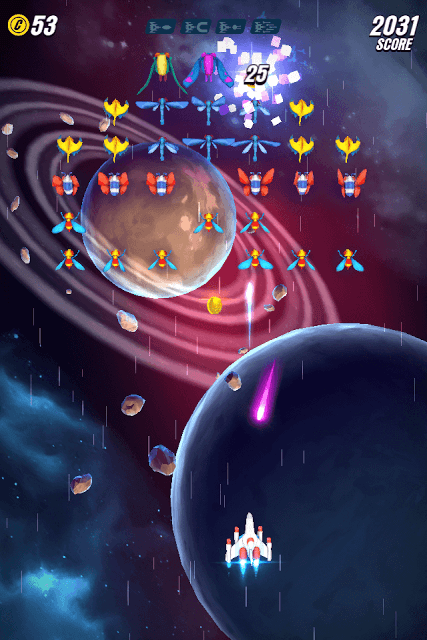 In Galaga Wars, the coins you collect from reward boxes and enemy drop can be used to upgrade your ship’s abilities. There are four types of abilities: Jumbo Shot, Magnet, Turret and Missile Barrage. These abilities can be acquired by collecting green ability medals that are dropped by destroyed enemies. Upgrading your ship abilities provides benefits like increase in the duration of the ability, increased blast radius or turrets etc. The abilities you collect stay for a limited period of time and upgrading them will increase their duration and provide other benefits that will help you destroy enemies quickly and effortlessly. Besides these 4 abilities, there’s a fifth power-up that boosts your ship’s Fire rate and upgrading it will increase fire rate further. As the name suggests, the bullets shot by your ship are bigger than normal bullets. Try to upgrade this ability to make the bullet size bigger and increase duration. Coins are attracted to a ship with Magnet ability. Coins floating in space will move towards your ship if you move it one step up. It all depends on the ability’s radius – bigger radius will make it easier to attract coins from a distance. Keep upgrading magnet ability to increase radius. When you get this ability, a tiny turret appears just above your ship and starts attacking any incoming enemy ships. Upgrade this ability to increase blast radius and duration. With this ability, your ship launches a barrage of homing missiles. Upgrading this ability will increase blast radius, duration, etc. The Fire-Rate Pickup power-up medal looks different from the ability medal. It’s a blue color medal with white lines etched on it. When you collect this medal, your ship fires faster. Don’t forget to upgrade this power-up to increase fire-rate and duration. Note: There are different types of ship and the abilities mentioned above are of your starter ship. You can buy new ships at the store (yellow ship icon) to unlock deadlier abilities. Once you have visited a new sector, you can unlock it using coins at the sector map. To fast-travel to a sector, you will need warp capsules, but if there’s a video option available then it’s better to choose that option. This way you can save warp capsules for future use. You can get warp capsules from reward boxes and from enemy drops in boss rounds. How do you get more purple medals to unlock news ships? The only way to get purple medals (credits) is to destroy maples. They are spotted in each sector in every 15 hours. While battling aliens, you may spot a maple, which appears from a tiny worm hole. Shoot the maple to get a purple medal.